It’s almost that time again. Warm weather is coming. A lot of people are happy about this, but I’m not one of them. And I think most runners in warmer climates probably feel the same way. Running in cool weather is spectacular, but running in hot weather is miserable. Last summer was a horrible experience from July through October so I’m not looking forward to repeating it again in 2016. That doesn’t mean I’m not preparing for the worst, though. I got through the hot months last year alternating between my only two pairs of serviceable running shorts, but there’s no way I’m going to do that again. So even in the middle of the Southern California winter I started replenishing my supplies. Now I have about eight pairs of running shorts from several different companies and I feel prepared for the coming heat wave. 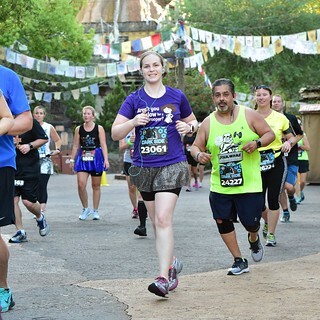 I even wore two pairs of the new ones for the Star Wars races at Disney World earlier this month and they worked great. It was the first time in 2016 that I had to trade in my capris for shorts, but it definitely won’t be the last. But even with my new warm weather wardrobe I’m going to refrain from saying, “Bring on the summer.” As far as I’m concerned it can arrive as late as it wants (preferably after the Fourth of July). As a side note, I have a little anecdote from my trip to Florida. Before I left for the Star Wars races in Orlando I realized that I needed a couple of new pairs of shorts. Not running shorts (I had already invested in plenty of those), but some khaki and denim shorts I could wear to the parks in the warm April weather. I had one or two pairs that might work, but it’s always good to have choices. So I turned to Old Navy, my most reliable supplier of basic apparel. I placed an order for a couple of pairs of shorts and prayed that they would arrive before I had to leave for Florida. So I was excited to find the package on my doorstep a few days early. Hooray! But when I opened the bag it was full of toddler clothes rather than the much-needed adult-sized shorts. The packing slip had my correct order listed, but the items themselves were WAY off. I sent everything back to Old Navy after writing, “Not even close!” on the packing slip. Luckily my trip was short enough for me to get by with the shorts I already owned. I’ll have to give Old Navy another chance because I know I’m going to need all the shorts I can get this summer. After more than a year of deliberations, on Tuesday I registered for the Walt Disney World Marathon in January 2017. I’m not quite sure what I’ve gotten myself into, but there’s no turning back now! Come hell or high water I’ll be running 26.2 miles the day before my next birthday. It’s a frightening prospect with only a couple of years of running under my belt, but I think I can do it with the right training. Funny enough, I’ve already paid an outrageous amount of money to secure a spot in this race, but my training doesn’t start until September. The week after the Disneyland Half Marathon, actually. Until then I’ll just be attempting to build up and then maintain some semblance of fitness. This spring is all about getting back in shape (I have four more half marathons in the next six weeks plus a 5K and a 10K), but the summer will be more difficult. Trying to keep up a consistent running routine when it’s hot outside won’t be easy for me. As much as I loathe the idea, I may have to become a morning runner. It won’t help that it will still be ridiculously hot when my marathon training plan is scheduled to start. I’ve already put all of the September through December training runs on my wall calendar at work so I have some idea of what I’m facing. Even though I don’t even have to start for more than four months, I’m still scared. Am I completely crazy for signing up for a marathon? Time will tell, I guess. If I’m lucky I’ll be a marathoner on my 38th birthday! Last July registration for the 2016 Seal Beach 5K/10K opened for previous participants. Since I was sure I’d want to run my hometown race this year I signed up for the 10K to take advantage of the low price for early registrants. 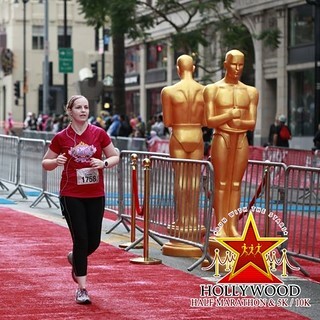 Fast forward six months to December when I discovered the Hollywood Half Marathon. 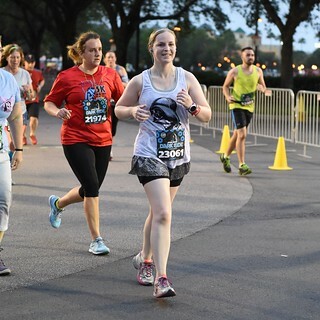 Knowing that I wanted to run as many half marathons as possible in the spring I signed up for it without checking for conflicts on my race calendar (which I maintain on a wall calendar at work and in an Excel spreadsheet at home). Big mistake. 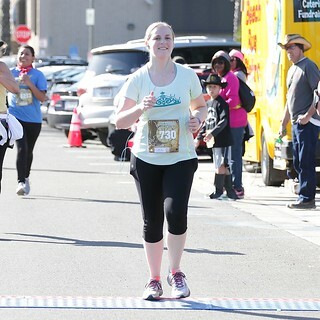 Luckily the Seal Beach 10K registration fee was really low so I wasn’t that concerned about it. I forgot about my dueling races until about a week before they were both set to take place. To keep the registration from going to waste I offered my spot to a co-worker and he took it. He even went to the packet pickup himself to get the bib and shirt (which he was even able to exchange for his size). No effort required on my part! It was great. 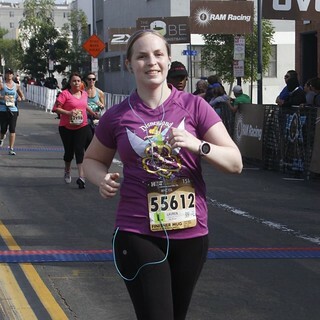 To augment my laziness, I also avoided having to drive up to Hollywood before the half marathon. Races that don’t have race day packet pickup are very annoying, especially if they require a significant drive to get there. I thought I’d have to make the miserable drive from Orange County to Hollywood, at least an hour each way, on either Thursday or Friday afternoon to get my bib and shirt for the Saturday morning race. Not a fun prospect. But then another co-worker offered to pick up my things on Friday since she was staying at hotel in the area overnight. How did I get so lucky? Two races and I didn’t have to lift a finger for either one before race morning! On the morning of April 9th I drove up to Hollywood before 4 AM. (Not quite the way I prefer to start my weekends, but runners make sacrifices. Mostly sleep.) At that hour of the morning traffic was mercifully light so I got to the parking structure at Hollywood and Highland in record time. The bit of rain I encountered on the way made me nervous for the weather during the race. Running 13.1 miles in a downpour would be intolerable. I brought a poncho with me to prevent getting drenched beforehand, but I’d have to ditch it when the race started to avoid overheating. It seems that the prayers of all of the runners were answered because the skies granted us a reprieve…at least for a while. (And in the meantime the clouds kept the sun away.) 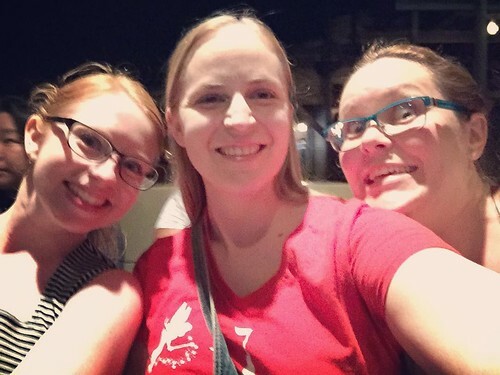 I met up with my fantastic co-worker at the start line and got my bib that she’d picked up for me the day before, and we all started running around 6:30 AM. The rain held off until I was at about mile 10. It wasn’t ideal, but fortunately the rain was light enough to not cause serious problems (i.e., squishy shoes/socks or heavy, chafing clothes). My final time was slow, but respectable for me in my current circumstances. 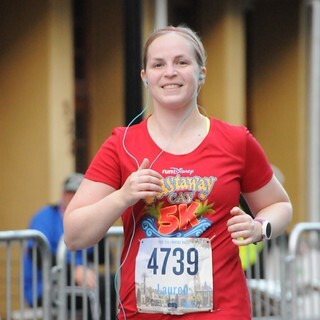 I’m still not in the greatest shape since getting injured so I was just happy to finish at all. It was my practice run for the Star Wars Dark Side Challenge the next weekend at Disney World. More on that later! It’s April and I haven’t made all of my New Year’s resolutions yet. It seems I’m procrastinating at a professional level these days. (Except for the fact that I’m almost completely packed for my trip to Orlando on Thursday. That’s an unprecedented state of readiness for any of my travels.) First of all, I’d like to preface this third resolution of the year by confession that I have been thoroughly failing at resolution #2 so far. I have eaten more McDonald’s that I’d like to admit in the last few months. Those Egg McMuffins are addictive little suckers. Although I had one minor victory yesterday when I didn’t patronize the McDonald’s drive thru on my way home from the Hollywood Half Marathon. It’s possible I avoided it because by then it was noon and it takes longer to get Egg McMuffins after normal breakfast hours, but I like to think that willpower won that battle instead. Hopefully I’ll be able to continue the trend in the future. Anyway, back to the resolution at hand. I’ve been pretty successful at taking healthy, homecooked lunches to work with me on weekdays, but dinners have been problematic. Most days when I get home from work I’m tired and hungry – a combination that doesn’t facilitate the best meal choices. At the end of the day I had no energy or desire to do any sort of food preparation. This usually led me to eating Cheez-Its, or some other comparable form of junk food, right out the box. There was a distressing lack of protein, vegetables, or nutritional value of any kind. Empty calories, basically. Something had to change. So when I saw an online advertisement for Freshly, a mail-order meal service, I decided to give it a try. A lot of my friends rave about companies like Blue Apron that ship you all of the necessary ingredients required to cook your own meals, but the thought of having more work to do when I got home every evening wasn’t appealing. But Freshly is different because it delivers healthy, pre-made, single serving meals each week. The only effort on my part would be pushing some buttons on the microwave. I can handle that! And I figured the variety of meals would give me some choices for dinner each night, but only good choices. No more Cheez-Its. So I took the plunge and signed up, and so far I’m impressed! I haven’t had a single bad meal yet, and some of them have been downright delicious. For example, tonight’s dinner was flat iron steak, sweet potato hash, and creamed spinach. So tasty. I’ve only had the subscription for three weeks, but I’m really glad I gave Freshly a try. Now I use actual silverware to eat my dinner rather than shoveling snack food items into my mouth with my hands. We’ll see how it goes in the future!